The UK Ministry of Defense is preparing a prototype “Star Wars” laser weapon. Britain has followed the lead of the US Navy, which tested its “highly effective” weapon last year on the USS Ponce in the Persian Gulf. 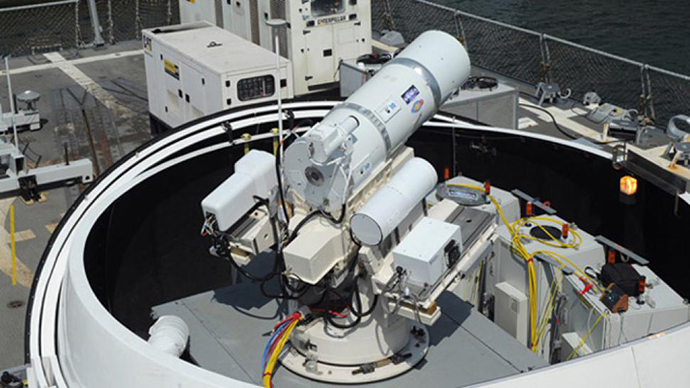 Fired from a warship, the laser weapons are able to shoot down missiles and drones, and destroy other naval targets. Under the Geneva Convention, lasers cannot be used as anti-personnel weapons. The project, known as the Laser Directed Energy Weapon Capability Demonstrator, will cost up to £100 million, according to the MoD. It is expected to “become a critical defense on a future generation of warships,” as it is thought to be both economical and precise. Weapon trials aim to determine whether a high-energy laser prototype can track and hit targets in any weather. According to the MoD, the potential of laser-based weapon systems is an “opportunity” to “dominate battlefields,” as they appear to be more cost-efficient than conventional missiles, shells and bullets. “Already the US has deployed their naval weapons system in the Gulf for operational testing,” he said. However, their short range means they are unlikely to fully replace missiles that can hit fast-moving targets many miles away.